Cigar Geeks - Viewing a Thread - Xiphos Short Panatellas on Sale~! Xiphos Short Panatellas on Sale~! Subject: Xiphos Short Panatellas on Sale~! Save 40% | 15ct Can Only $44.95 + FREE Shipping! Xiphos is a brand new name in the premium cigar business, little known for now but sure to take off like a rocket when word gets around. Made in the same Costa Rican factory that produces some of the world’s finest cigars, including Royal Danish and MBombay, Xiphos Small Panatela is constructed with a 3-country filler and binder blend containing Ecuadorian, Peruvian, and Dominican tobaccos. Each cigar is then finished with a golden Ecuadorian Connecticut wrapper leaf. All Xiphos cigars come from the factory hermetically sealed in cans containing 70% humidity to ensure pristine condition at the time of smoking. The 5 x 38 Xiphos Small Pantela cigars are blended to be ultra smooth, yet have a spicy core that provides plenty of flavor. At the beginning, grassy, earthy flavor is notable with hints of white pepper. As the cigar progresses, cinnamon, honey, and some sweet floral notes are dispersed throughout the flavor profile. Clean, smooth, and distinctly medium-bodied, Xiphos is sure to please the most discriminating palates. Luxurious, yet simple, Xiphos Small Pantela cigars are appropriate for just about anyone. The price point to quality ratio is simply amazing and satisfaction is always guaranteed. Xiphos pairs well with champagne or white wine and is in the same Ecuadorian Connecticut league as Romeo y Julieta Reserva Real and Rocky Patel Vintage 99. Xiphos cigars are named after the Iron Age sword used by ancient Greeks. Thankfully, though, there’s no need to go to battle in order to have a fantastic smoking experience with these lovely cigars. Subject: Re: Xiphos Short Panatellas on Sale~! Good price on a good smoothe stick! 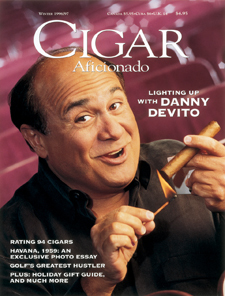 An excellent cigar! Great on both humid/hot days and frigid/cold ones! Too bad I'm on a serious freeze right now because I have been wanting to try these. Great price though. I want to know if a "try it out" maduro comes with a can of these? Sounds great, may need to find a stick or two. These are a real nice stick. Shoot me a copy of your order confirmation and I will send you one~! ive got one of these resting, I should smoke it soon. I can vouch for the Habano for sure, great stick, smoked it the other night! Another 10% off using the code "blast"! Makes them $40.45 shipped! E-mail forwarded to you Brad! This offer stands for anyone else that buys a can of the Small Panatellas as well folks~!!! Been waffling since you posted this up, as if the offer itself isn't good enough. You'll probably hear from me tonight. I still have a half dozen left. Maybe next time I'll get as lucky as you all with getting that maduro! Just buy some more Justin, at $40 plus another free stick, you can't beat that deal! I will definitely end up with an order soon.... need to make some space first. Yea I know.But I was considering it anyways and the chance to taste one of those maduros put me there.I'm sure there are others. I've been wanting to try one of them as well, hence the feeler for a taste of the goods! 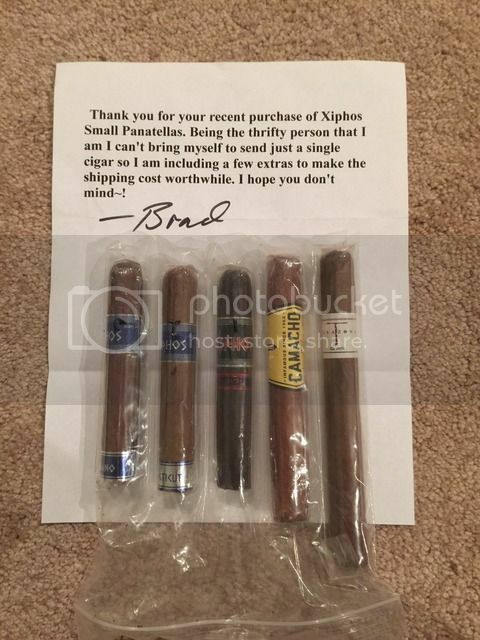 Well, I got a package from Brad today with my maduro to try as well as some bodyguards. That definitely drives down the price on them!